How many cups in a pound of butter? How many sticks of butter in a pound? You've found pounds of flour in a recipe, but you're not familiar with these units! This pounds to cups calculator is the solution to your problem. Not only you can convert flour pounds to cups, but also cups of sugar to pounds. Wondering how many cups in a pound of butter? Or how many sticks of butter in a pound? Easy-peasy! Scroll down, and you'll find a simple explanation, conversion table, and even a little buttery infographic. If you're looking to convert from metric units of weight, check out our popular grams to cups calculator. Weight is usually more accurate when it comes to measuring the amount of cooking ingredients you need. 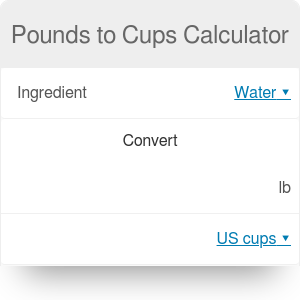 If you prefer volume units such as cups, you can use our pounds to cups calculator! However, you need to remember that densities of products vary among brands, so the one you have may differ a bit. We've chosen the averaged value from several sources, so the value should be more or less fine. If your recipe doesn't require high precision, our pounds to cups calculator is a safe bet. Flour is an essential ingredient in baking, but also if you're a fan of pancakes or crêpes. Challenge yourself and try one of 15 unique recipes for pancakes from all over the world - you won't be disappointed! If you want to know another conversion than one sugar cup to pounds, just use our tool! Pounds to Cups Calculator can be embedded on your website to enrich the content you wrote and make it easier for your visitors to understand your message.